What Does Code P0171 Mean? OBD II fault code P0171 is a generic code that is defined as P0171 – “System Too Lean Bank 1”, and is set when the PCM (Powertrain Control Module) receives input data from the #1 oxygen sensor or air/fuel ratio sensor on bank 1 indicating that the air/fuel mixture has been too lean for an extended period of time- usually about 20 consecutive seconds. Note that “Bank 1” refers to the bank of cylinders that contains cylinder #1, and that “#1 oxygen or air/fuel ratio sensor” refers to the sensor that is located upstream of the catalytic converter on Bank 1. In a fully functional system, the upstream oxygen sensor or air/fuel sensor directly measures the amount of oxygen in the exhaust stream as it leaves the engine as a means for the PCM to control the air/fuel mixture. On gasoline engines, this mixture should ideally consist of 14.7 parts of atmospheric air to one part of fuel, which ratio is known as the “stoichiometric ratio”, expressed as 14.7 : 1. On engines that use oxygen sensors, this ratio will be expressed as a variation on most scanners; for instance, 15.5 : 1 when the mixture is too lean, while on engines that use air/fuel ratio sensors, the ideal stoichiometric ratio will be expressed as “Lambda 1” with deviations from the ideal ratio being expressed as a fraction of “1” on most scanners if the mixture is too lean. In practice, while oxygen sensors and air/fuel ratio sensors work on vastly different principles, both types of sensors perform the same function. When the exhaust stream passes over the sensing element, the sensor generates a signal voltage that is directly proportional to the amount of oxygen in the exhaust gas. Thus, when the sensor detects a lean-running condition for whatever reason, it signals this fact to the PCM, which then takes corrective action by making suitable adjustments to the fuel delivery strategy, ignition timing, and sometimes to the configuration of the variable valve/cam timing system. In a fully functional system, these adjustments are performed several times per second, and all faults that prevent the PCM from controlling the air/fuel mixture effectively will result in dedicated codes being set. However, in some cases, such as where the air/fuel mixture is being influenced for an extended period of time by for example, unmetered air entering the engine through vacuum leaks, the PCM’s ability to correct the mixture is limited, and it will set code P0171 and illuminate a warning light as a result. Where is the P0171 sensor located? Most engine vacuum systems are somewhat complex, and a leak can occur almost anywhere in the system. Having a vacuum system diagram for the affected application on hand is therefore strongly recommended when diagnosing code P0171. However, unless the vacuum leak is obviously the result of a broken, split, or dislodged vacuum hose, other possible leaks could be through perished or damaged inlet manifold gaskets, or splits and/or tears in the inlet ducting. The image below shows typical damage to a flexible part of the inlet duct that can cause unmetered air to enter the engine. Note that although this type of damage is extremely common, it often remains undetected unless the inlet duct is removed from the engine for proper inspection. What are the common causes of code P0171? NOTE: The above causes are the most common. Refer to the “Common Mistakes” section of this guide for details on less likely, but nevertheless possible causes of this code. How expensive is it to fix code P0171? Due to the large number of variables involved in this code, it is not possible to provide a cost estimate that will be even remotely accurate for all, or even most applications. What are the symptoms of code P0171? What are common solutions to code P0171? NOTE: Other possible solutions include remedies that pertain to faults and defects described in the “Common Mistakes” section of this guide. Note that in these cases, the remedies/solutions are make and model specific more often than not, so refer to the affected application’s manual for details on possible repair options. How serious is code P0171? While most instances of code P0171 is unlikely to cause damage to parts and components, it should nevertheless be considered as fairly serious. In some cases, such as where this code is present on applications with automatic transmissions, the PCM/TCM may not be able to control the shift pattern effectively if the engine is hesitating and surging by turns, as often happens on many BMW models. How safe is it to still drive the car with code P0171? Code P0171 should be repaired without delay, since driveability can be seriously affected. This poses an obvious safety risk, and especially when driving in traffic when a sudden and unexpected loss of power can cause accidents and crashes. How difficult is it to repair code P0171? Non-professional mechanics should note that because there are a great many possible places for unmetered air to enter the engine, diagnosing and repairing this code can vary from being easy, to being extremely challenging and difficult- even for professional technicians. If the vacuum leak is not obvious, it might become necessary to remove or disassemble unrelated components in order to gain access to the entire vacuum system. In some cases, it may become necessary to remove the inlet manifold to inspect gaskets and/or seals. What are the common mistakes when repairing code P0171? While low fuel pressure can cause lean-running conditions over extended periods, low fuel pressure conditions will invariably be indicated by codes that relate directly to the fuel system and to the fuel pressure in particular. Note that dirty and/or clogged fuel filters are a common cause of marginally low fuel pressure that may or may not generate a fault code. Defective oxygen and air/fuel ratio sensors can also set this code, but defective sensors will also invariably be indicated by codes that relate directly to these sensors. Defective or clogged fuel injectors can also cause, or contribute to code P0171 being set, but bear in mind that defective injectors will invariably be indicated by dedicated codes. Defective MAF (Mass Airflow) sensors that “under-, or over report” the volume of air that passes through them can also set this code or contribute to its setting, but again, defective MAF sensors will almost certainly be indicated by dedicated codes. However, in some cases, such as on applications that use excessive amounts of oil (BMW, Mercedes, Audi, VW, Honda) a simple cleaning of the MAF sensor element will often cure this code even if no MAF sensor related codes are present. In fact, on the above-mentioned applications, cleaning the MAF element with an approved cleaning agent should be the first step in diagnosing/repairing code P0171. NOTE: The conditions described above represent a relatively large number of possible additional codes that could conceivably have contributed to the setting of code P0171.Therefore, all and any additional codes MUST be investigated and resolved in the order in which they were stored BEFORE an attempt is made to diagnose code P0171. How do you troubleshoot code P0171? NOTE: A hand-held vacuum pump that is fitted with a graduated gauge is essential to diagnose this code. If additional codes are present, refer to the “Common Mistakes” section of this guide, and resolve all additional codes strictly in the order in which they were stored as per the instructions in the manual for the affected application before operating the vehicle and scanning the system again to see if code P0171 returns. If, however, no additional are codes present, it would be safe to assume that the problem involves unmetered air entering the engine. Start the diagnostic procedure by inspecting the inlet tract for leaks. Look for splits, tears, or perforation in soft, flexible ducting, and make repairs or replace damaged sections of the inlet tract as required. Pay particular attention to sites where various sensors plug into, or attach to the ducting, Check that all seals are in perfect condition and replace any that are not. Also, check all clamps and/or clips that join the various parts of the inlet tract together- check that all clamps/clips are properly tightened, and that the box holding the air filter is undamaged and properly sealed. Make repairs as required. Clear all codes after repairs are complete, and operate the vehicle normally before rescanning the system to see if any codes return. If the inlet tract in is perfect condition, and the code/symptoms persist, inspect the entire engine vacuum system for damaged, dislodged, split, perforated, or hardened vacuum hoses and/or lines. Notes that on some applications, it may be necessary to remove protective shields and other components in order to gain unimpeded access to some parts of the vacuum system or vacuum operated components. Consult the manual to determine the correct procedure to remove covers, shields, and other parts/components that prevent access to all parts of the vacuum system. Replace any obviously damaged vacuum lines/hoses, and operate the vehicle normally before rescanning the system to see if any codes return. If the code persists, use the vacuum diagram to locate all vacuum check valves, actuators, and other vacuum controlled or vacuum dependent components. Check each individual check valve to ensure that air only flows though it in one direction, which is always indicated on the valve with an arrow or some such device. 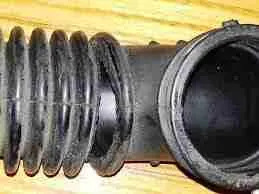 Replace any vacuum check valve that allows airflow in both directions. Test all vacuum actuators to ensure that they hold a vacuum that is applied to it with the manual vacuum pump. Replace any actuator from which the vacuum decays- however slowly. Clear all codes after repairs are complete, and operate the vehicle normally before rescanning the system to see if any codes return. NOTE #1: Don’t neglect to test the PCV (Positive Crankcase Ventilation) valve as well. If this valve is stuck open, it will almost certainly cause code P0171 to set. NOTE #2: Be sure to check the oil filler cap on applications (BMW engines come to mind) that require a specified vacuum in the engine to operate smoothly. If the code persists, but it is certain the engine vacuum system is intact and free of leaks, suspect a leaking inlet manifold gasket. However, non-professional mechanics should take note that removing an inlet manifold is more often than not a complicated job that requires special tools and skills that most non-professionals do not possess. Therefore, if there is any doubt about your ability to remove and reinstall a manifold successfully, the better option is to refer the vehicle to the dealer or other competent repair facility for professional assistance. What if the air fual sensor is okay and the head gasket are fine and I cant find any holes that may have a leak what could be the problem for this code and loss of power?